This past week I had the opportunity to attend the Detroit Jazz Festival. The lineup was incredible, including Wayne Shorter, Geoff Keezer, Pat Metheny, Wynton Marsalis, Chick Corea, Gary Burton and more! The only problem was trying to figure out who I would see because many of the performances occured simultaneously. I was amazed to see such large, enthusiastic audiences at the festival. Here are some pictures I took! 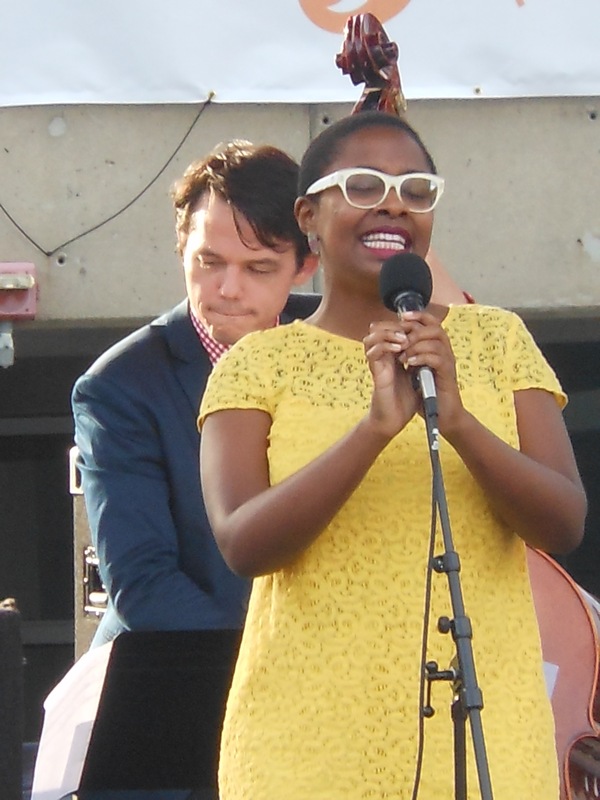 A major highlight of my experience was hearing vocalist Cecile McLorin Salvant (recent winner of the prestigious Thelonious Monk Competition). This was the first time I heard Cecile and I was blown away. I agree with Diehl in an important aspect – the strong aural connection between Cecile and Vocal Jazz giants of the past. There were moments in Cecile’s set where I clearly heard the influence of Sarah Vaughan, Billie Holiday and Betty Carter. For example, she often uses a very wide vowel placement in her lower register similar to Sarah Vaughan’s approach (for an example listen to Sarah sing Lullaby of Birdland). Diehl is also correct in alluding to the fact that many young jazz vocalists are not studying the masters in detail. Too often I find out who a vocalist was influenced by through their website or liner notes rather than their music. I understand and support the concept of individuality and innovation. However, I do not believe an audible connection to a particular musician can diminish your personal artistic identity. Of course musicians can take this approach too far. In Cecile’s case, I felt she used vocal devices of Sarah, Billie and Betty appropriately and creatively. I found it incredibly refreshing to hear this link to some of my favorite vocalists. Furthermore, the combination of these familiar inflections with her own style and interpretation constructed a unique sound and style that I really loved. Her set was very eclectic including one original composition (Woman Child), a vocalese piece (Moody’s Mood for Love), early American Popular music (Nobody), a reinterpreted folk song (John Henry), and standards (such as Yesterdays & There’s a Lull in My Life). I recorded a few just for you, but mostly I was happy just to listen! Enjoy.